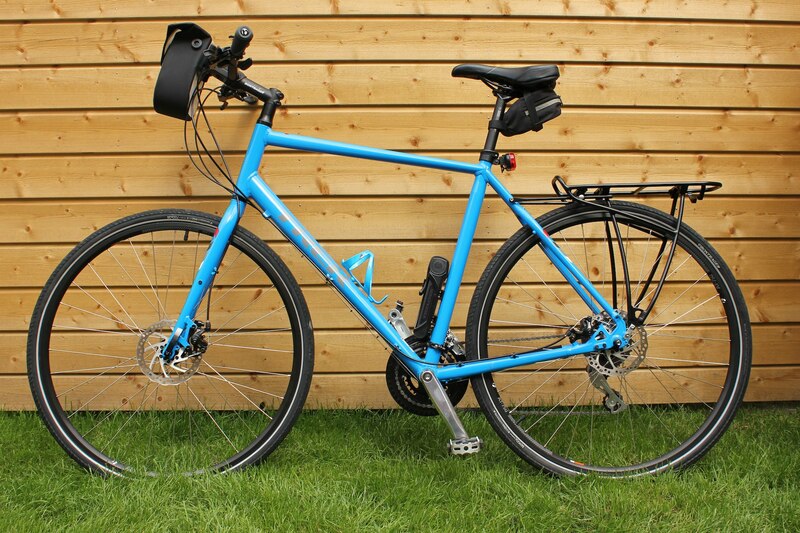 New bicycle, for the shed, new mudguards needed. 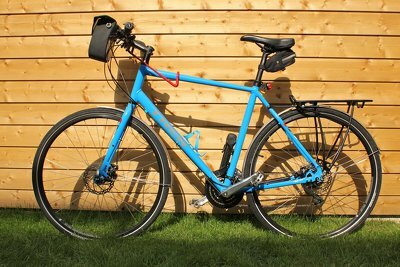 This time I needed something that would fit around 35 mm tires and mechanical disc brakes. 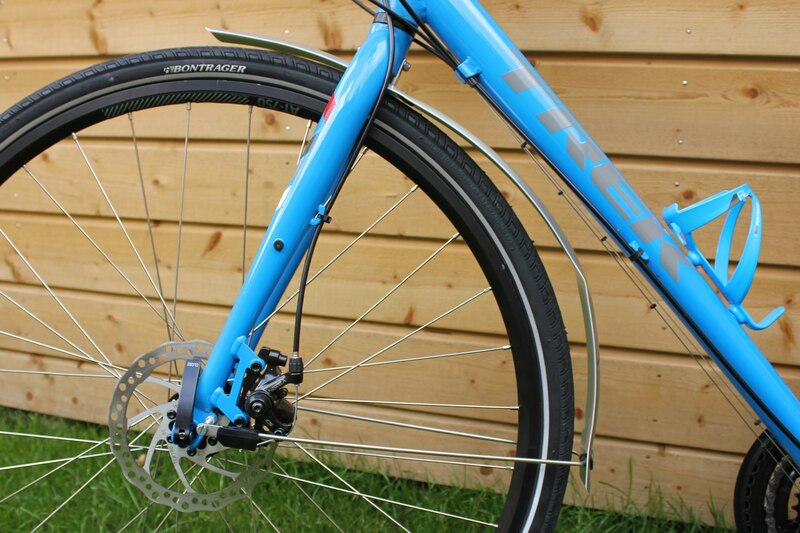 The Curana C-Lite mudguards are marketed as the most stylish ones around. They come in different widths and in the colors silver and black. I meant to buy black, but ended up with silver because I chose the wrong color buy accident, one of the pitfalls of online shopping. The 35 mm wide ones were out of stock, so I got the 40 mm one. It's an appropriate to have the mudguards slightly wider than the tires anyway. The silver set was about 30 euros, the black set is about 3 euros more expensive. They come in the sizes 30, 35, 40, 45, 50, 55, 60 and 65 mm wide for 26" and 28" tires. 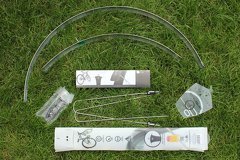 Curana is a Belgian manufacturer. Although "Made in Belgium" does not quite instill the same feelings as "Made in Germany" I did not let that hold me back, our waffle iron is made in Belgium too, and it makes decent waffles. 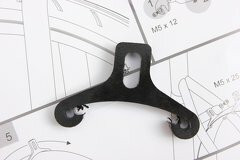 The packaging is pretty clever, you can inspect the mudguards before opening it, and all the mounting hardware is cleverly hidden inside. With a scissor you can open it all up. The included instructions were minimal, just a bunch of pictures. 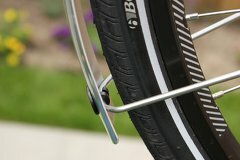 What surprised me was that there was no mention of any emergency release system for the front mudguards that prevent the wheel from locking up should something get stuck between the tire and the mudguard. The mudguards are made out of a composite of aluminum with plastic sandwiched between. metal studs that keep the mudguards in place are one piece that are secured with a plastic piece that acts as a twist lock mechanism. Pretty clever, since no tools are required. The downside of having the attachment mechanism inside the mudguard is that it needs to be moved away from the tire more for proper clearance. The SKS Bluemels and Hebie Viper Stadtmeister mudguards solved it differently. 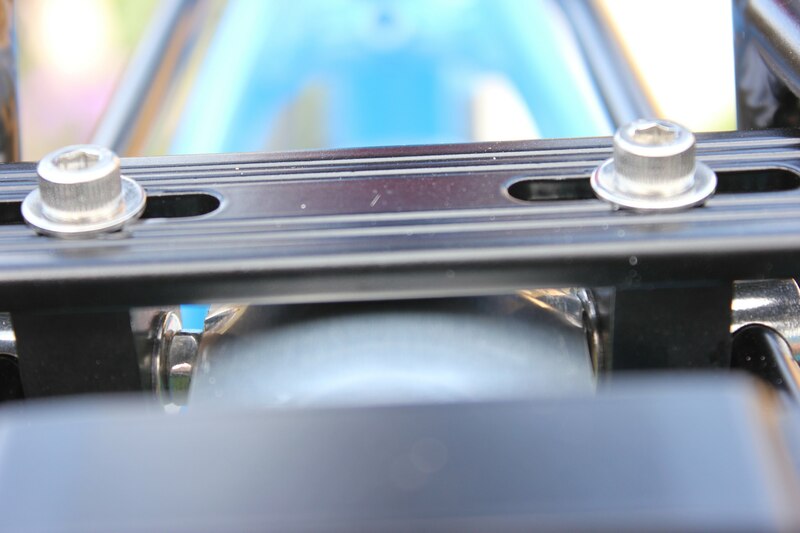 At the ends of the studs there are large plastic pieces that allow you to adjust the length. For some reason this requires a cross head screwdriver, while all the other screws need a hex-key. 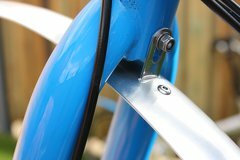 The mudguards also come with a plastic piece to secure the rear mudguard to the frame on the bridge on on the seat stays. Unfortunately it was not machined properly, the two holes on the sides did not connect to the main cut out. I solved it by cutting away the excess material myself, but an obvious oversight in the quality assurance department. 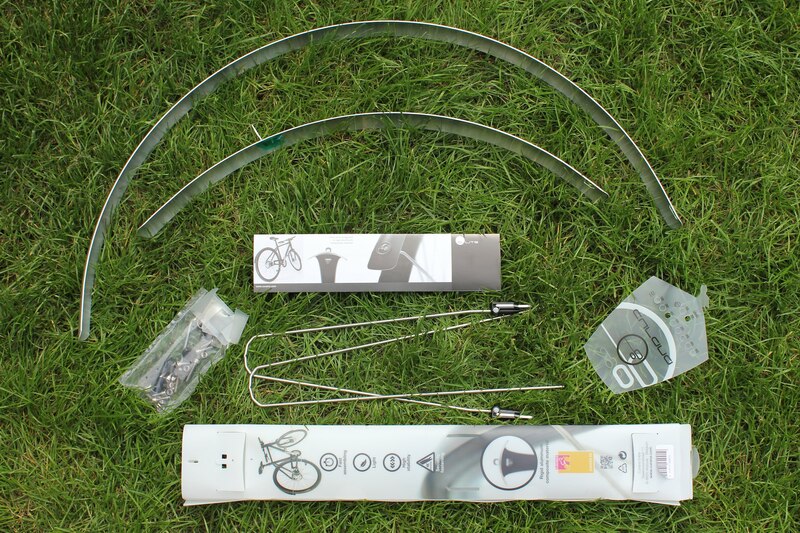 Having installed four different types of mudguards on different bicycles the past years I thought this was going to be a breeze. The front wheel is usually the easiest, so that's where I started. The instructions showed something different, but at least there was a long bolt to fit through the fork crown included. Securing the studs near the fork ends was however not as easy. 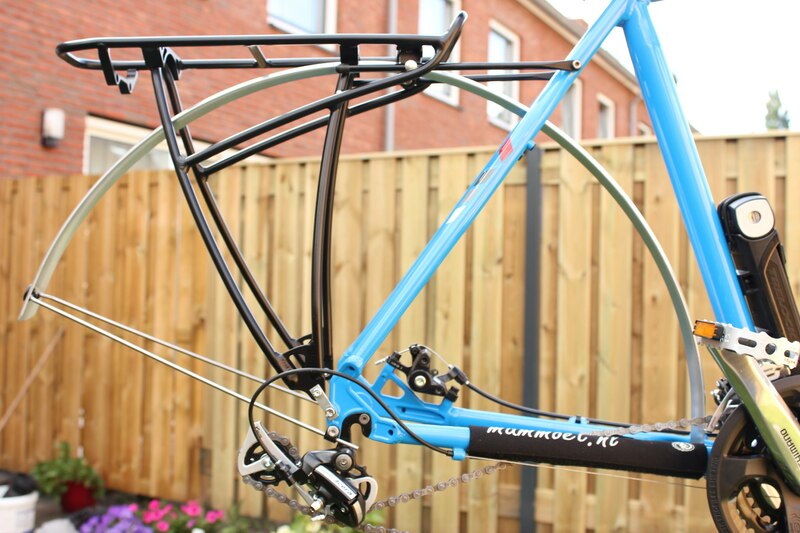 Despite the fact that these mudguards only have a single strut on each side I could not get it to go underneath the disc brake caliper. The problem was large the plastic adjustable part. Being experienced with this, I whipped up another Fender extender, this time with some Loctite to prevent any loosening. After some adjustment with the length of the studs we had a well fitting mudguard that was clear of the brake caliper. Around the rear wheel is always where things get difficult. 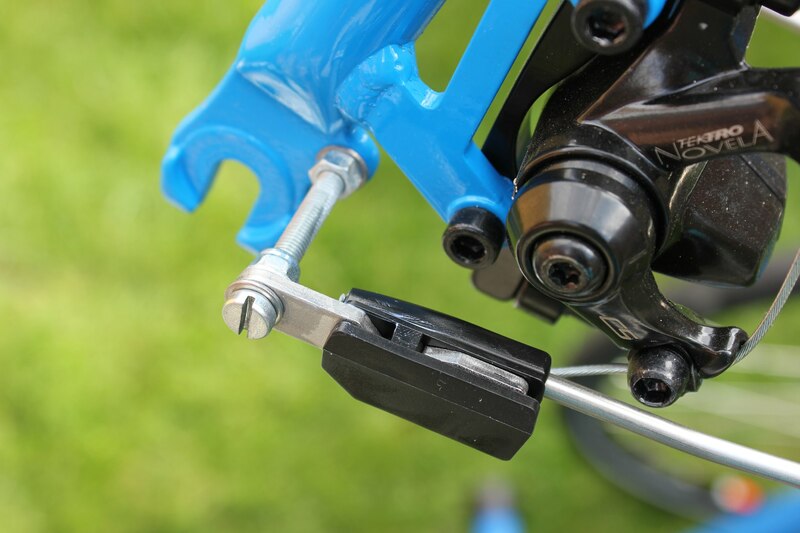 This bicycle had the disc brake caliper on the inside of the rear triangle, so the studs fit fine. This time however, the rear rack was getting in the way. Mounting on the seat stay bridge also didn't work. 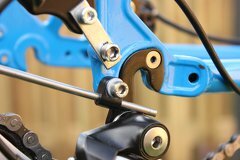 It would require to pull mudguard too far away from the wheel. The wheel had to be removed to install the mudguard. In the process the derailer was scratched by the sharp ends of the studs. 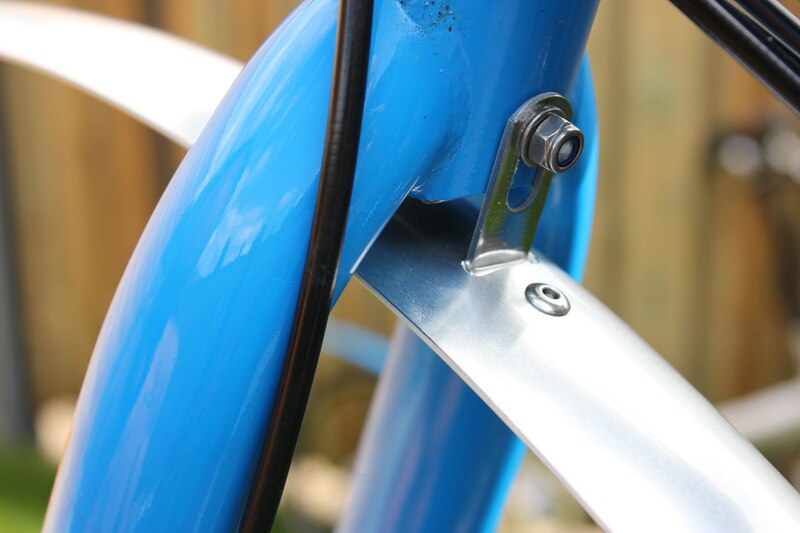 The mudguard fit into place by bending it between the bolts of the rear rack. A slightly narrower mudguard would probably have fitted more easily. The upside was that it was tightly secured to the rear rack, unable to rattle and not needing any more securing on the bridge. On the first ride the rear mudguard caught some poop that the tire had picked up. The next day the front mudguard was damaged. The person riding the bicycle was pedaling backwards and his foot caught the bottom of the mudguard. This caused the mudguard to bend and left a permanent dent and deformation, because aluminum does not bend back. All the parts in the set. Long bolt with locknut for the fork crown. A big chunk of plastic where the disc brake sits required an extra long bolt from my own collection. Stuff on the inside of the mudguard does not help with tire clearance. Those holes should be part of one big hole. Removing the rear wheel makes it easier. 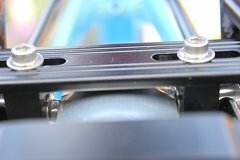 The mudguard had to be bent to fit over the bolts of the luggage carrier. The studs have sharp edges that scratched the derailer. 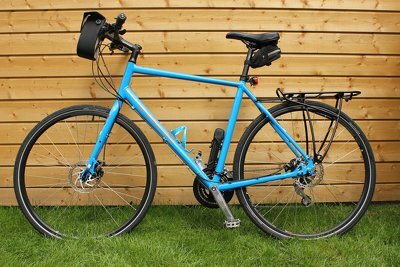 The Curana CLite mudguards are supposed to be the most stylish among mudguards, although that is a matter of opinion I do agree that they are quite stylish for something that is supposed to catch dirt. They are also very light weight. The praise stops there though. The instructions are unclear, there was a quality control issue, they are finicky to install and don't play well with disc brakes. They lack basic a safety mechanism that other mudguards have. Worst of all they are so fragile that they got damaged within 24 hours after installing them while in normal use. 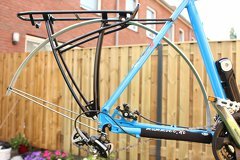 Blue Trek Allant 7.2 2016 bicycle without mudguards. 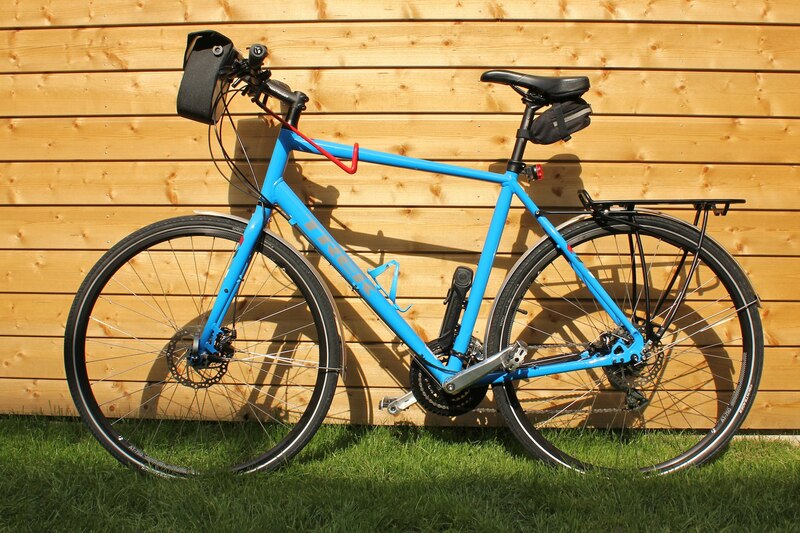 Same bicycle a few hours later with Curana CLite mudguards installed.